StatCounter is one of my top favorite free web statistics and traffic tracker, except with one notorious limitation – the limited log size. Although summary history data on the visitors and traffic is kept forever, but whenever you want to drill down to review or investigate the log detail about a particular visitors on a popular and busy website or blog, you’ll be restricted to last 100 visits. If each unique visitors makes more than 1 page view, so in actual, StatCounter users have much less than 100 visitors’ detailed logs. And finally StatCounter raised the log size limit, from 100 to 500 for both free account and upgraded account. With this increase of log memory size , StatCounter has become one of the best, if not already the best web traffic analytic tracker available for free, especially for those who likes simple and easy to use web hit counter and ability to have web traffic summary consolidated in one page. Too bad StatCounter doesn’t automatically adjust and increase the log size. If you have many projects (websites and blogs), this trick will make adjusting the log size is simple, and easy. Instead of “1. Click the wrench icon beside your project, 2. Click ‘Adjust Log Size’, 3. Enter ‘500’ and 4. Click ‘Adjust Project Log'” as instructed by StatCounter for each and every projects, simply click on “Adjust Log” on the My Projects summary page (the page right after login). You will come to Adjust Log Quota page. 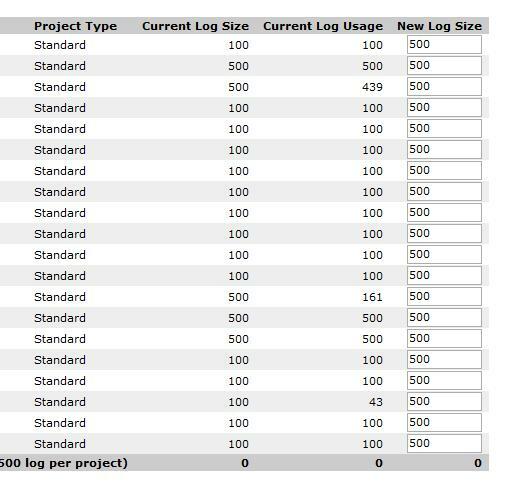 You will see a list of all available Project Name with their respective “New Log Size”, which for free account should be 100 before change. Simply type 500 to the first box, and copy and paste the text of 500 and paste replace all subsequent boxes. For upgraded account, add 400 to your existing log size. Click on “Adjust Log” button at the bottom when done. And voila, all your projects now 5 times more log than previously.